All kinds of public transportation passing through Coastal Road and Cavite Expressway (CAVITEX) on their way to and from Manila will be required to end and start their trips at the soon-to-open Parañaque Integrated Terminal Exchange (PITx), the country’s first intermodal transport terminal, according to a new order issued by transport regulators. Under Memorandum Circular 2018-20 signed September 13, the Land Transportation Franchising and Regulatory Board (LTFRB) directed all public utility vehicles with routes from southwest of Metro Manila to the National Capital Region to end their trips at the PITx if they go through Coastal Road and the Cavite Expressway. The order covers not just buses but also jeepneys and UV Express vans, some of which travel between some municipalities in Cavite province and cities within Metro Manila such as Makati and even Navotas. The order will effectively shorten their existing routes up to PITx only, which is located at the southern edge of Metro Manila. 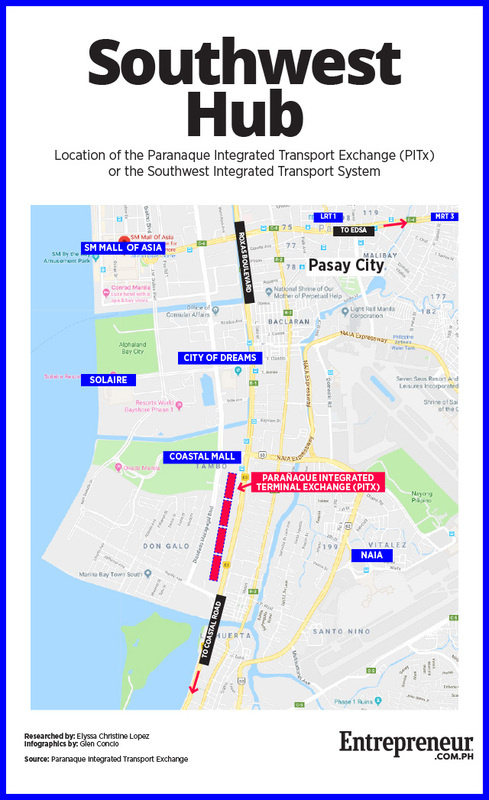 Conversely, the routes of city buses, jeepneys and UV Express vans whose last stop is the SM Mall of Asia or Baclaran will be extended to the PITx to serve terminal users travelling to and from other parts of the metropolis. PITX is located in a mixed-use commercial and office tower complex at the edge of the Manila Bay Area bounded by Diosdado Macapagal Boulevard to the west, Roxas Boulevard to the east, Seaside Drive to the north and Pacific Avenue to the south. The LTFRB order is in line with Executive Order No. 67, which mandates the establishment of an integrated transport system in the north and south of Metro Manila. PITX is set to be the first intermodal transport terminal in the country, serving those commuting to and from southwest of Metro Manila. “The terminal’s southern location will reduce the number of provincial buses from Cavite and Batangas operating along major roads EDSA, Baclaran and Taft Avenue,” the memorandum circular said. The MC is deemed effective 15 days after its publication in major newspapers. The PITX is a project being built by MWM Terminals, a consortium of Megawide Corp. and WM Property Management Inc. (Waltermart). The consortium signed a 35-year concession agreement to build-operate-transfer the PITx. PITx, also known as the Southwest Integrated Transport System, is Megawide’s second public-private partnership project. The company is also part of the group that operates the Mactan Cebu International Airport, which recently opened its second terminal in July. Related: How Much Will Megawide Corp Earn From PH’s First Modern Bus Terminal? According to Megawide, the project cost the company Php5.6 billion to build. It features arrival and departure bays, public information systems, online and on-site ticketing systems, baggage handling facilities and park-ride facilities. The company also said it is expected to cater to 100,000 passengers every day, with up to 4,000 passengers per hour at peak hours. Once opened, the PITX will be the latest endeavor of the government to curb heavy traffic in Metro Manila. In 2013, the Metro Manila Development Authority launched a bus dispatch system terminal in Coastal Mall in Pasay City to regulate the number of buses plying EDSA, but it has since ceased operations.